Historic building, built in 1907 with decorative terracotta, has 235 units, presently being managed by EMB Development Group.The Mark Twain Hotel operates under Sec 42 of IRC as a Low Income Housing Tax Credit Property. The building underwent a complete rehab in 1998-99 of $6 million dollars. General Partner Amos Harris converted the property from regular transient for the period 1996-1997 to Low Income Housing and currently serves as a comfortable & affordable housing for low income population and clients of social service agencies. 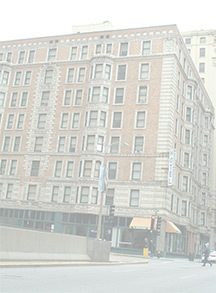 The 102-year-old Mark Twain Hotel is located in the heart of downtown St. Louis at 9th and Pine streets. Designed in 1907 by architect Albert Bartleton Groves, its exterior represents one of the city's most elegant old architectural structures with its stacked bay windows and glazed white terra cotta friezes. It was previously known as the Baltimore Hotel and the Maryland Hotel. Today, the Mark Twain serves as low-cost housing for those who want to live and work downtown. Its 235 rooms on eight stories are rented on a weekly basis. Two restaurants and a retail store occupy its lower levels, adding to the growing diversity of businesses in downtown St. Louis’ urban core. Located in heart of downtown, residents living at Mark Twain find it easy to commute to work and other places.